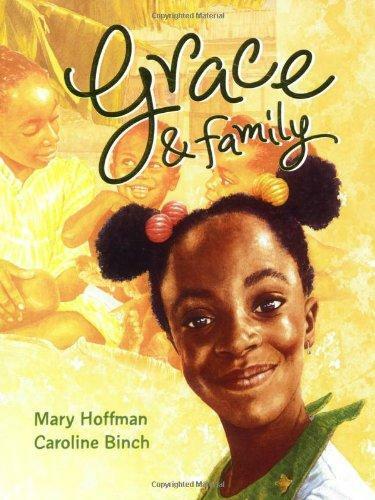 Grace lives with her Mama, her nana and her cat, Paw-Paw. Her dad lives far away in Africa. When Grace is invited to stay with him and his new family, she is very excited but finds it difficult too. She is not sure if she can fit into Dad’s new family. This is a beautifully illustrated story in which Grace finds out she is still an important part of her dad’s life and that families come in all shapes and sizes. Read the story aloud allowing time to talk about the illustrations and what is happening as you do. When you share the story again your child could join in with Grace’s reactions at different points in the story, for example her surprise at receiving the ticket and her crossness when she meets Jatou. As they do this, children will really be thinking about how Grace feels at different points in the story. Having heard the story read aloud a few times your child could tell it to you using the pictures as a guide to what is happening. Share favourite parts of the story or favourite illustrations with each other and talk about why you like them. Was there anything your child was puzzled by? If so spend some time talking about these things as well. If the story carried on what would your child like to happen next? Choosing two soft toys or dolls to be Grace’s step brother and sister, Neneh and Bakery, your child can pretend to be Grace and tell them fairy stories – ones without wicked step mothers of course! Draw pictures of all the people in Grace’s family; in England and in Africa and label them. Using the postcard template provided your child could write a postcard as if they are Grace – writing to Ma to tell her some of the things she has been doing; maybe after going to buy material in the market or going to see the sacred crocodiles.